Finding games on the internet that are age appropriate and engaging for a child can be difficult. 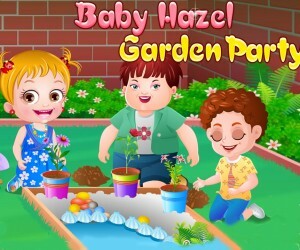 Baby Hazel Skin Care is an easy, interactive, and fun game for young children to play, teaching them as they play. When you start this game, the initial graphics are bright and cheerful. From this screen you can check your credits, access more games, view the instructions, or play the game directly. The background music for this game is light and air with a different melody on each level. There are instructions before each level. First, the baby needs to be taken care of after she comes in from outside. The game uses a hand feature to brush off snow, with a pointer arrow to direct where to brush. Next, the child is to remove the winter clothing with the grabbing tool and place them on the coat rack. The game uses thought bubbles to indicate which piece of clothing needs to be handed. This teaches picture matching and following directions, as well as moving the mouse and clicking. On the top of the screen, it shows the level of happiness, the time left to play the level, and the score. When your child passes a level it shows the points earned, bonus points if any, and the happiness level. During play, if the player makes a mistake and selects the incorrect item, Hazel indicates her dislike with a pouty face. If your child fails at a level, the baby is put into a crib and cries. There is a thought bubble which has the information of how many points are earned and the baby’s level of happiness. Level 1 involves taking care of the baby when she comes in from outside. In level 2 the player will give baby Hazel a bath, using the same methods as in round 1, but with more items. 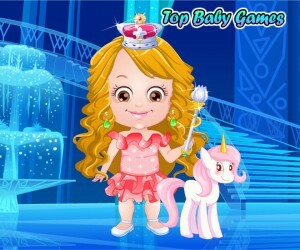 In Level 3, the player will change and clothe Baby Hazel. The next level is in the kitchen where she will be fed. This level challenges the player with the specific placement of items. Once this level is complete, the game is over and the screen indicates the final score and happiness, as well as baby in her crib smiling and being very happy. It is skin care time!!! Being winter, Baby Hazel’s skin is turning too dry and cracking all over. She needs an urgent skin treatment to get back the glow and softness she used to be. First give Baby Hazel a warm bath. Then apply cream on her cracking skin and lip balm to chapped lips. Finally feed her some healthy food to keep her fit and healthy. 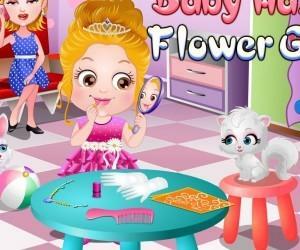 Help Baby Hazel to complete all skin care activities without making her cry. 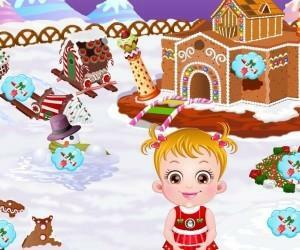 Keep Baby Hazel happy through out to earn more points.